Hello, my #LittleRebels! Have you ever bought something that did not exactly fit right, but you decided to purchase it anyway simply because you wanted it too much? Well, I found myself facing a similar problem a few days ago. I went to the SM Aura shopping mall last Monday to celebrate a friend's birthday. While browsing through a couple of stores, I came across this amazing pair of black spiked slip-ons that I immediately knew I had to have in my closet! Honestly, it was love at first sight. After trying them on, I could say that they were perfect. 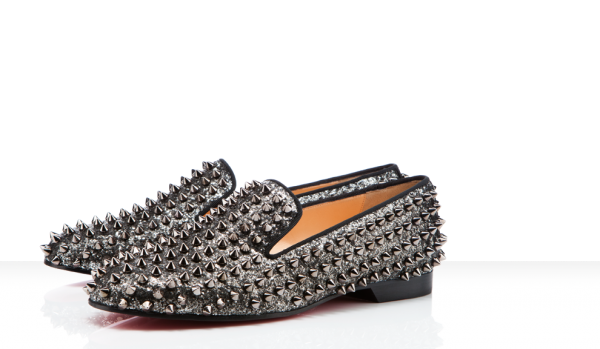 The fact that they were spiked and sparkly (a blend of edginess and glamour) really appealed to me. But wait! There was only one problem . . . They did not exactly 'fit'. Darn my size 9 feet! I asked the store associates if they had a pair in my size, but unfortunately they didn't. Size 8 was the largest size that they had available. Of course, since I wanted the shoes so badly, I decided to make a list of reasons of why I should get them (as opposed to why I shouldn't lol). 1) They weren't THAT tight on me. Sure, they felt a little uncomfortable, but beauty is pain, right? RIGHT? 2) I can always bring an extra pair of shoes with me in case the size 8 shoes started hurting my feet too much. 5) Need I say more? However, as I was about to purchase them, my friend told me to walk around the store for a little bit and see if I could tolerate the discomfort that the shoes were causing me. Reluctantly, I agreed. I spent a good 15 minutes walking around the shop and browsing through the other items. After that, though, I had to give it up. The shoes started to cause me extreme pain! Since they were too small, they were making my toes bend at awkward angles every time I took a step. I guess they weren't "perfect" after all. I guess it wasn't meant to be. This started to get me thinking about real-life relationships in terms of shoes. At first glance, it may seem perfect to you. Maybe you'd even go so far as to call it "destiny". So you try it on, hoping for the best, and even though you start noticing that something is wrong, you force yourself to believe that everything is okay as long as you "bear the pain". After a while, the pain becomes too much for you to handle, but still you try to tough it out. I mean, it's perfect! It's everything you ever wanted! The pain will be worth it in the end, right? THE ANSWER IS NO. Just like the pair of sparkly spiked shoes that caught my heart, eventually you'll get tired of the pain, and you'll decide that they're no longer worth the agony and the stress that they are imposing upon you. Eventually you'll have to accept that no matter how much you want it, IT DOESN'T WANT YOU. And the worst part is, you'll end up hurting yourself while the shoes remain perfectly intact. I wanted the shoes even though they were too small for me. I really, really did. I even made up so many excuses to convince myself they were worth it. In the end, though, I did not end up purchasing them. Because I realized something . . . THE PAIN ISN'T WORTH IT. So even though it broke my heart to leave the shoes behind, I knew that one day, I'll find another pair . . . An even better pair. A pair that won't hurt whenever I wear them. A pair that fits just right. And THAT will be worth it. "With the right person, you don't have to work so hard to be happy. It just happens, effortlessly." This is so true, love the post. As I was reading it, all I was thinking about was in everything you do be it relationship, clothes, shoes, a job whatever it may be, if it doesn't fit discard fast. Thanks for the post. These are so cute!!! But the pain is not worth them, shoes should be comfortable! hey..nice article. ' love your post. you can try using a hairdryer to warm it up, wear the shoes with thick socks and it should be a little bit less tight! Ugh, I absolutely know the feeling. This happens to me often, but in my case, I have small feet! The last time was very painful because I really fell in love with a pair of red pumps. But it was 3 sizes larger than my size. I even considered purchasing it, that I would only wear it while doing photo shoots because it would not be noticeable (because yes, that's how gorgeous the shoes were!). But I knew that would be silly and it won't be worth it because I would love to actually wear the shoes. Those shoes are definately worth the pain, haha! Of course it happened! I have shoes that are too small, or clothes too large. I only buy shoes with some room now. cool shoes! I love Christian Louboutin! OMG this was seriously an amazing post. Your analogy is so true!!! we all at least once have gone through a similar experience, I mean with relationships, when we want to make them work so badly! you know? even when we know it does not worth it. I completely agree with your thoughts, you will find a better pair :) Thanks for sharing! I used to do this all the time and never though about it in terms of reality! Great analogy. I totally agree with you -- if it isn't the right fit, move along! These shoes have made for a brilliant analogy, Kylie! You have a very good point, if the shoes don't fit.. leave them behind (and the same applies to relationships)! Awesome post. Hope you have an amazing brand new week! These pairs so fashionable, I know some shoes aren't comfy at all, but can't really stopped me to grab them:). if I also walks around in shop, it makes me find even more to take them home with me. Terrible huh? . As a fellow size 9-er, story of my life! I hate how I convince myself that I won't have to walk far distances so it'll be okay. It's never okay! for making a shoe fit. they look awesome pa naman.